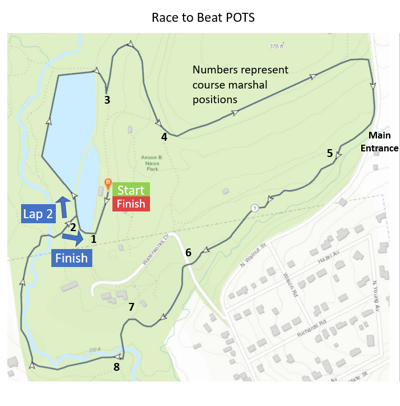 The Race to Beat POTS will take place in the scenic Anson B. Nixon Park in Kennett Square, PA. All proceeds from the event will benefit Dysautonomia International. The race will be chip timed by 2L Race Services and is sanctioned by USATF. The race course features a combination of paved, gravel, boardwalk, and trails that span throughout the park. Only the 1 Mile is wheelchair accessible. There are no major hills and the course narrows in a few places. Along the way you will get picturesque views including a lake and streams. Two water stations will be provided along the course and drinks will be provided before and after the race. The cost to register for the 5K or 1 mile is $30. Register by May 18th to be guaranteed a T-shirt and a goody bag. Raffle tickets will be available for purchase at the event for $1 each, so bring some extra cash to enter for our great prizes! Children under 6 are welcome and are free. Please register early! Ample parking available at the park at the main entrance off of N Walnut Rd. Additional parking is available in town at the parking garage for free. The race will begin at 10 am. Bibs will be available for pickup starting at 8:30 am as well as on-site registration. The bib pick-up and same day registration will be next to the stage. Please arrive early in order to receive your bib and T-Shirt. Same day registration will start at 8 am. Refreshments will be provided after the race. ​​​All proceeds will benefit Dysautonomia International. If you can't make the race, feel free to make a fundraising team or participate by running a 5K at home . Click the Donate link below to get started! Awards will be given to the top 2 males and females in the following age groups: 13 & under, 14-19, 20-39, 40-59, and 60 & up.